Aloe Vera is a plant used since antiquity for its many properties. To this reference asset are added fennel and cinnamon, ingredients used for their action on digestion. * The fennel is known to aid digestion, to contribute to digestive comfort and to help relieve digestive discomfort such as bloating while cinnamon contributes to the comfort of the stomach. 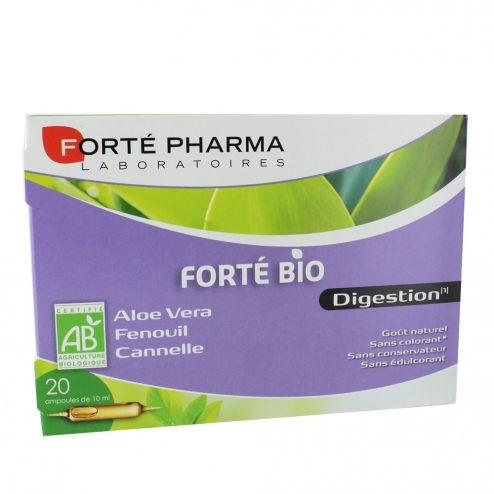 Take 1 ampoule of Fort� Bio Digestion after the main meals, to drink diluted in a glass of water. Shake the ampoule before use because a slight deposit, due to the presence of plants in the product, may appear. To prevent the possibility of bulb debris falling into the liquid, do not break the bulb above the glass. Ingredients: Purified water, Organic Aloe Vera Juice (Aloe vera L. Burm) Extract, Cinnamon Organic (Cinnamomum verum J. Presl), organic fennel extract (Foeniculum vulgare Mill). organic fennel extract (Foeniculum vulgare Mill) 64mg. Not recommended for pregnant or breastfeeding women and children under 12 years. This nutritional supplement is not a medication.